In our busy lives, it can be tough to find the time to get the nutrition we need from the food that we eat. In fact, about 90% of all people don�t eat enough fruits and vegetables. Luckily, cold-pressed juice from Tribest Juicers provide a quick and easy way to get the nutrients that we need. When we get the proper amount of nutrition, we look better, feel better, and have healthier lives. True beauty starts on the inside. With the Tribest Solostar 4, you can be beautiful on the inside too. Due to its smart design, the Tribest Solostar 4 crushes the competition by producing 26% more torque while using 10% less electricity. It has a gear reduction equivalent of a 5.4 HP motor. More torque means less jamming and less electricity means savings on your electric bill and carbon footprint. You get additional savings by lowering your grocery bill, because the Tribest Solostar 4 produces up to 40% more juice from your favorite fruits and vegetables. The sleek, compact, and modern design takes up less space while looking beautiful on your kitchen countertop. And, since all food contact parts are made from BPA- and BPS-free materials, you don�t have to worry about exposing your family to harmful chemicals. Each Solostar 4 also comes with a standard 15 year warranty, the longest warranty of its kind in the industry. 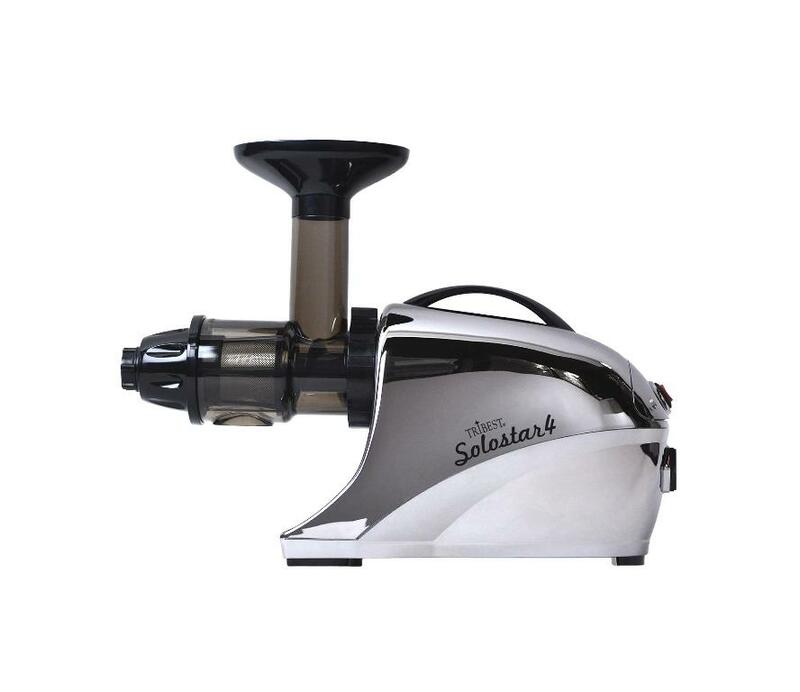 At only 57 RPM, the Solostar 4 is the slowest horizontal single auger juicer on the market. The slow and gentle juicing process virtually eliminates all heat and oxidation, preserving more essential nutrients and live enzymes. This results in healthier, nutrient-dense juice. Tribest Juicers are class-leading in auger size and Dual-Stage Extraction Process, which produces maximum juice yields. 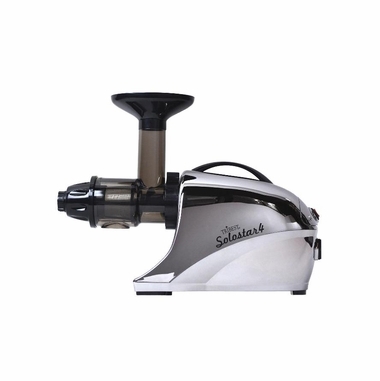 The Ultem auger in the Tribest Solo Star Juicer is also 8x stronger than other types of plastic, which allows for an aggressive auger design that makes it easy to feed your produce into the juicer. 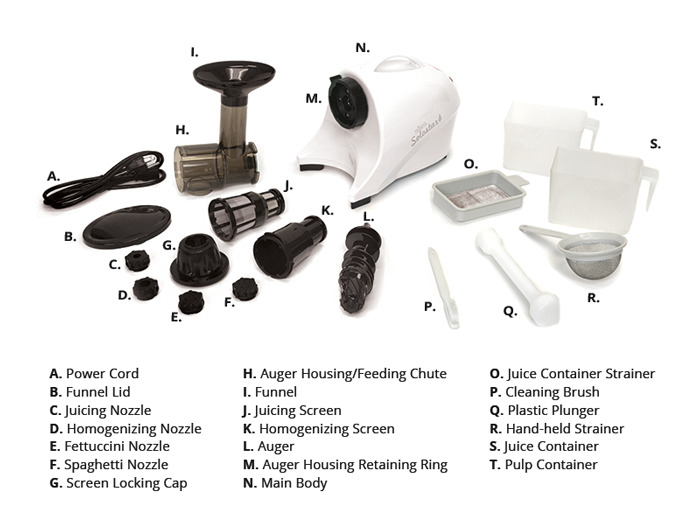 With Tribest Juicers you get better juice, more of it, and it�s easier to use.